"Sometimes I fear that some people have not yet understood that we are all in the same boat. We are really all in the same boat in Europe. That is why together, Greeks and all the other Europeans, should show the same resolve for the very important commitments that have been taken." 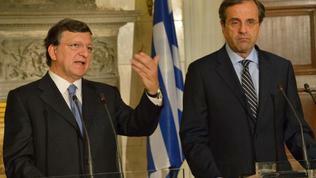 With these words European Commission President Jose Manuel Barroso appealed to the Europeans from Athens. 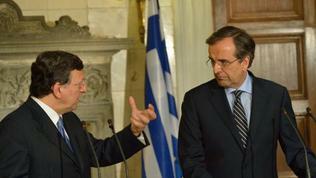 Barroso's message sounded as a response to the growing pressure on and within the EU. The relief after the latest European Council summit proved to be temporary and then again bad news for the euro area began to rain. Spain is pressed by both the markets, requiring higher and higher interest rates, and its own regions, facing financial distress. The Moody`s rating agency downgraded from "stable" to "negative" the outlook of the credit rating of Germany, the Netherlands and Luxembourg but since the rating of the rescue fund EFSF is based on their excellent ratings, its outlook has been downgraded too. This will affect the ability of the EFSF to raise funding at a time of increasing rumours that beside banks bailout, Spain may also request a full-fledged government bailout and Italy may ask for purchase of its government bonds. Moreover, doubts for serious delays in the implementation of the Greek rescue programme have intensified speculations that the country may not be given the next tranche of the second loan scheduled for September. There is a mission of the Troika (the EC, the ECB and the IMF) currently in Athens and the leaders of the ruling coalition Antonis Samaras, prime minister and New Democracy leader, Evangelos Venizelos, leader of the socialists, and Democratic Left’s Fotis Kouvelis are negotiating budget cuts amounting to nearly 12 billion euros for the next two years. They have agreed on 10 billion euros cuts and will continue the negotiations on Monday, the online edition of Ekathimerini newspaper wrote. Surely much of the savings will be made through reductions in social benefits, salaries and pensions. Meanwhile, Eurostat released data showing that in the first quarter of 2012 the Greek debt was 132.4% of GDP, which is 33% down from the fourth quarter of 2011 (165.3%). However, Greece still has the highest debt as a percentage of GDP in the euro area and suspicions have been circulating in media that another round of debt restructuring would be needed. At the same time, deposits in Greek banks have reached their lowest level in six years, the ECB data for June 2012 showed. In this situation, speculations about an impending Greek exit from the eurozone have gained momentum. The US Citi bank said that the chances of Greece leaving the euro in the next 12-18 months have risen to about 90%. Some German officials have also joined the chorus, like Philipp Roesler, the minister of economy and Bavaria`s Finance Minister Markus Soeder. 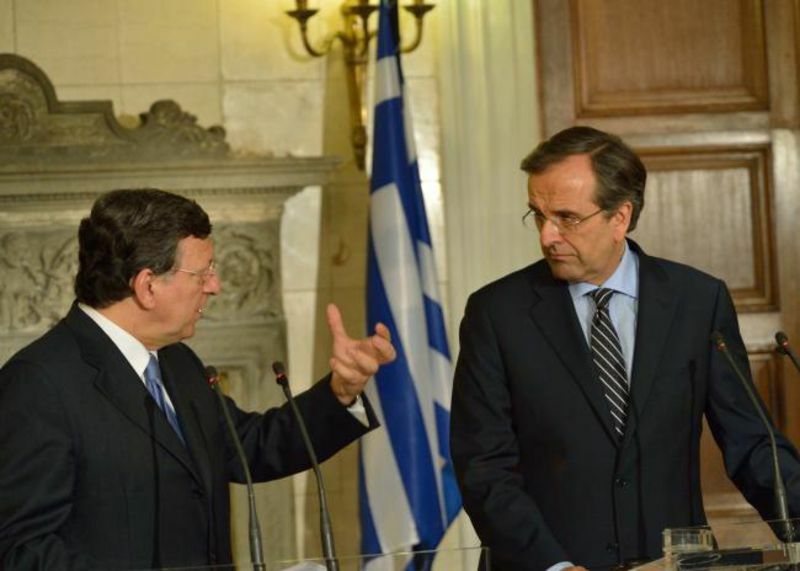 This is why, Jose Manuel Barroso's words were also criticism of such statements which, according to Greek Prime Minister Samaras, made Greece's efforts to reach the set targets more difficult. 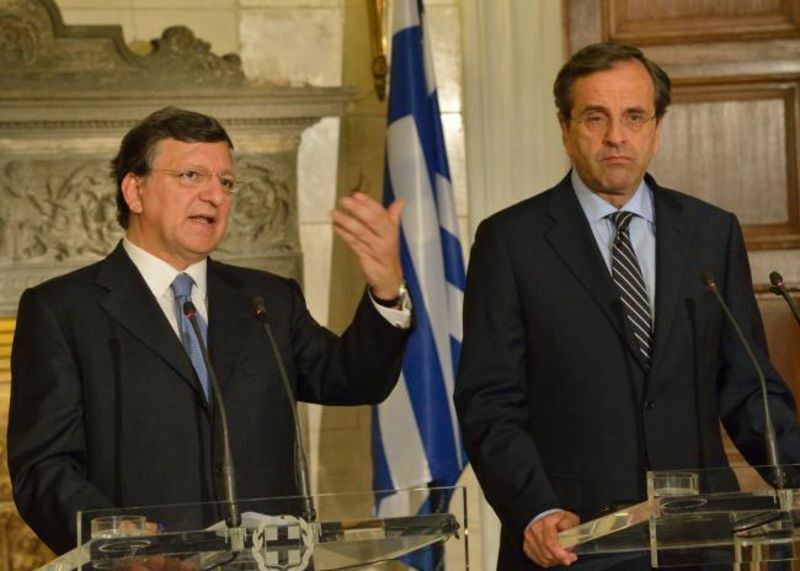 Jose Manuel Barroso stated he was a friend of Greece and that Europe would continue to support the efforts of the Greek people but that Greece was expected to deliver: "The key word here is: deliver. Deliver, deliver, deliver. The main issue is implementation to deliver results. To maintain the trust of European and international partners, the delays must end. Words are not enough. Actions are much more important." Barroso underscored his confidence that the Greek government was committed to the process of reform and would achieve the desired results. "The euro area governments and the European institutions, including naturally the European Commission and the ECB, will do whatever is necessary to secure the financial stability of the euro area." 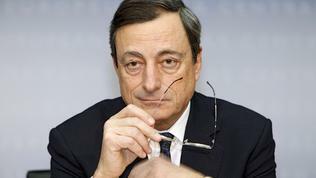 The same message, but from London, was sent by European Central Bank President Mario Draghi. "Within our mandate, the ECB is ready to do whatever it takes to preserve the euro. And believe me, it will be enough," Draghi said at an economic conference on the eve of the Olympics. 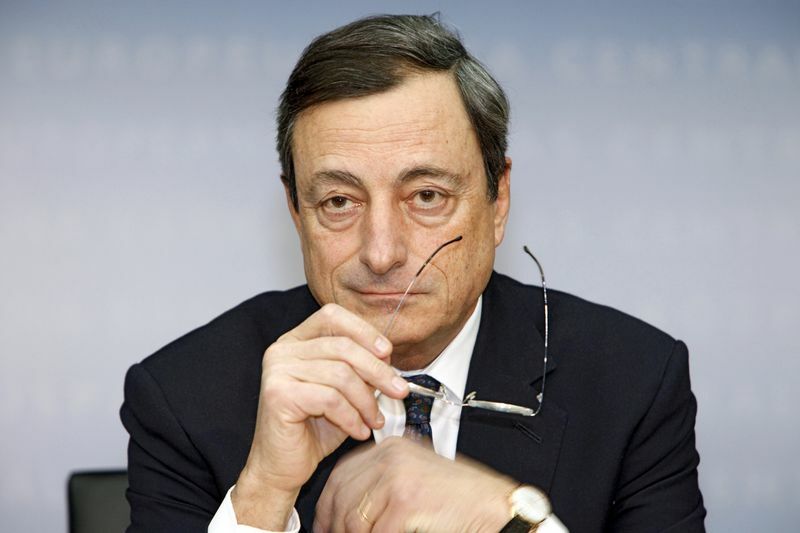 His words have literally shaken the financial markets but not because it was the first time for him to express the ECB's willingness to do whatever is necessary to maintain the euro but because this time Draghi added that excessive borrowing costs for eurozone countries came within the ECB`s mandate: "To the extent that the size of the sovereign premia hamper the functioning of the monetary policy transmission channels, they come within our mandate." Draghi`s words were immediately interpreted by markets as a sign that the ECB is ready to resume purchases of Spanish and Italian debt and the reaction was strongly positive. Borrowing costs of Spain and Italy quickly fell, but analysts warn that the effect will be only temporary if no concrete ECB`s action ensued. The ECB started buying Italian and Spanish debt last August under the so-called Securities Markets Programme, which it previously used to buy Greek, Irish and Portuguese bonds. The last time the programme was used was in January 2012 and since then Mario Draghi has given no sign that he is willing to resume it. The problem is that by buying government debt, albeit in limited amounts, the ECB is about to violate the prohibition to lend money directly to member states. However, at their summit in June the eurozone leaders have agreed the bailout funds (the temporary EFSF and the permanent European Stability Mechanism, which is expected to start to operate soon) to buy debt of troubled countries, as the ECB will serve as an agent to the funds in conducting market operations.